A monthly bilingual nondenominational religious periodical that was linked to leading figures in the 1904-05 religious revival. The periodical's main content were religious articles. The periodical was edited by the Baptist minister, Rhys Bevan Jones (R. B., 1869-1933) until May 1916, by R. B. and the Calvinist Methodist minister, William Nantlais Williams (1874-1959) until January 1926, by R. B., Nantlais and the Reverend T. R. Williams until May 1933 and subsequently by Nantlais and Williams. 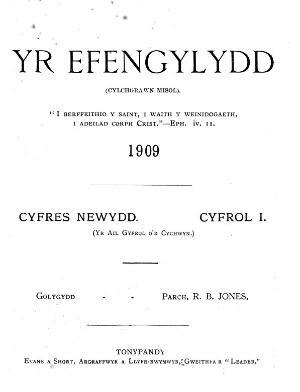 Associated titles: Y Lladmerydd (1926).